Urban Betty is excited to bring on Kerastase as our newest product line! Kerastase is a luxury line that performs by giving our guests the most healthy hair by treating key issues. 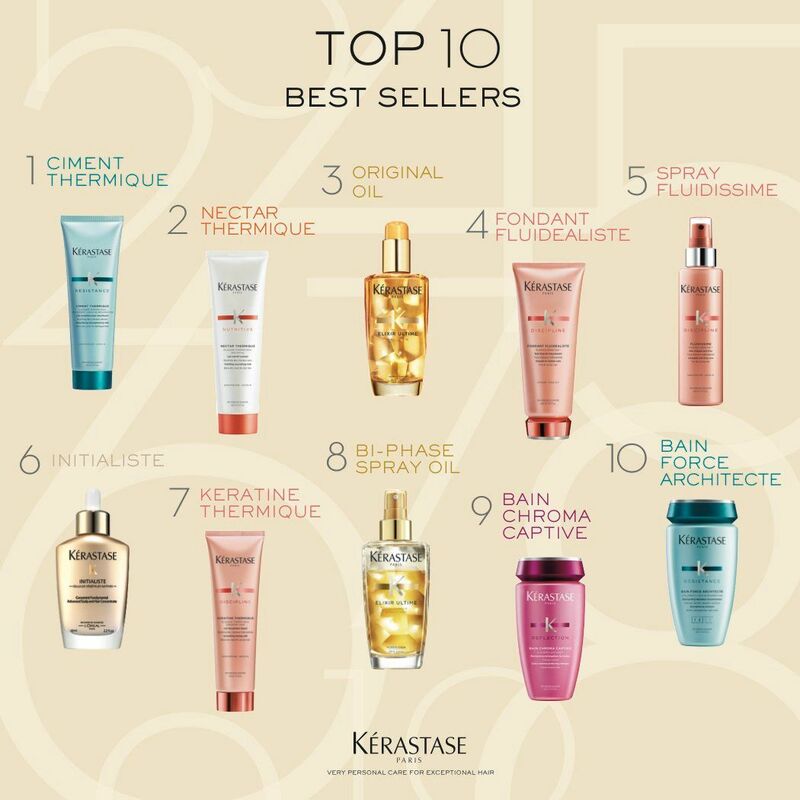 To help you get more familiar with Kerastase, here is a list of their top 10 sellers, saving the best for last. 10. Bain Force Architecte. This is a repairing and reconstructing shampoo for damaged hair. The fibers in this product revitalize the hair with each use. 9. Bain Chroma Captive. This product is a sulfate free shampoo for color treated hair. It helps preserve depth, shine, and provides 33-50% less color fading with its UV protection (perfect for the Texas sun). 8. Bi-Phase Spray Oil. A versatile bodifying oil mist for fine to normal hair. The formulation of this product gives oil the power of volume. It expands hair volume and thickness while enhancing shine and softness. 7. Keratine Thermique. A heat protecting blow dry primer for unruly and frizzy hair. It smooths frizz, has impeccable humidity protection, and can resist heat up to 450 degrees. 6. Initialiste. This is an advanced hair and scalp treatment inspired by skincare. It maximizes the potential length of your hair keeping it stronger as it grows. 5. Spray Fluidissime. This is a thermal, anti frizz, protective spray for unruly and frizzy hair. This product is known to control frizz for up to 72 hours and helps with faster blow dries. 4. Fondant Fluidealiste. Smoothing conditioner for unruly and frizzy hair. This conditioner smooths the hair's surface for immediate and weightless fluidity. 3. Original Oil. This is a versatile nourishing oil for normal to thick hair. You can use this oil before, during, or after blow dries for all hair types. This oil gives the ultimate shine and nourishment. 2. Nectar Thermique. A heat protective blow dry primer for dry hair. This blow dry cream smoothes away dull surfaces for an intense shine. This can protect the hair up to 450 degrees. 1. Ciment Thermique. A heat protective blow dry primer for damaged hair. Kerastase' best seller strengthens and fortifies the hair, smoothes away cracks and split ends, and is an excellent leave-in product.